Atiku Abubakar, Nigeria's former Vice-President and presidential candidate of the Peoples Democratic Party (PDP), is currently lobbying the United States of America for support in his quest to challenge the outcome of the February 23 presidential election. The Independent National Electoral Commission (INEC), declared President Muhammadu Buhari, candidate of the All Progressives Congress (APC), winner of the election, announcing he polled 15,191,847 votes while his closest challenger, Atiku Abubakar, secured 11,262,978 votes. 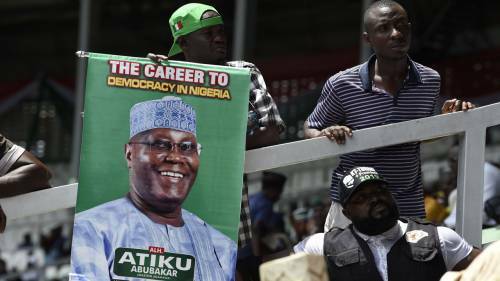 However, according to a report by the Centre for Responsive Politics (CRP), a research group dedicated to tracking money in US politics and its effects on elections and public policy, published on Monday, Atiku has enlisted the assistance of two high-powered lawyers in Washington DC, to "help in his legal challenge after his election loss". Atiku had filed a suit before the Presidential Election Petition Tribunal challenging the outcome of the election and insisting that he won the election. According to the report, "Abubakar has ties to those in Trump’s orbit, having hired political consultants like Riva Levinson, who worked with Paul Manafort, and Brian Ballard, a major Trump fundraiser." Reference was also made to Atiku's much-publicised visit to the US, during which he stayed at the Trump International Hotel in Washington DC. His visit to the US made major news since there were allegations that he could not step on the shores of America as a result of corruption-related issues. A Senate subcommittee report on foreign corruption had referred to a transfer of millions of dollars into the U.S. through shell companies by Atiku, although he didn't face prosecution. In 2009, the FBI alleged that he demanded bribes from former Rep. William Jefferson (D-La. ), who was convicted of corruption charges. Jefferson stored $90,000 in cash for Abubakar in his freezer at some point. Filings accessed on the Foreign Agents Registration Act (FARA) by CRP's Foreign Lobby Watch on March 24, showed that former Justice Department official Bruce Fein and his firm, Fein & DelValle PLLC, registered as foreign agents on the PDP presidential candidate's behalf. "Fein, the associate deputy attorney general in Ronald Reagan’s administration and general counsel to the FCC, played a significant role in the repeal of the FCC’s 'Fairness Doctrine'. He also later worked with then-Rep. Bob Barr (R-Ga.) in drafting articles of impeachment against Bill Clinton. Joining Fein in the effort is his partner at the firm, W. Bruce DelValle, who according to an online biography has a varied background tackling civil rights and constitutional law issues, litigating intellectual property and liability disputes, along with representing a number of sports and entertainment personalities," the report noted. According to CRP, the agreement notes that Lloyd Ukwu, “a Nigerian barrister and trusted confidant [of Abubakar],” is assisting “in the operations of the U.S. Situation Room.” Ukwu, referred to as a critic of Buhari and founder of a group called We the People of Nigeria which claims to be an advocate for “free and fair elections", recently led a delegation to meet with a variety of government officials in the State Department, Congress and “delivered a letter to the [acting] United States Ambassador to the United Nations, Jonathan Cohen, in New York to ensure the success of the Nigerian elections". According to the filing, Fein will be paid $30,000 over a 90-day contract to provide “legal, consultancy and public advocacy services to encourage Congress and the Executive” to wait on recognizing a winner of the Nigerian election until after the legal challenge is “impartially and independently resolved". Another filing states how the influence campaign will be conducted, noting that lobbyists will meet with members of Congress and their staff to persuade them to pass resolutions in the House and Senate “to forebear from a final declaration and recognition of a winner” until after Abubakar’s appeals are decided fairly and independently. Additionally, the firm will “draft articles and op-ed pieces” about the issues surrounding the election and appear on television and other media programmes. In the contract, Fein’s firm is explicit in promising to “obtain official recognition that you are the authentic President of Nigeria based on an accurate counting of legal ballots". The goal of the effort is straightforwardly described as “to convince the United States that your presidency would open a fresh and new chapter in Nigerian politics". The filing also asserts that the lobbying effort will demonstrate that an Abubakar presidency is “the will of the people", warning that if Abubakar is denied a victory, problems like genocide, poverty, corruption and strife will “undoubtedly continue". The US has long had close relations with Nigeria and is the country’s largest foreign investor. American troops work alongside the Nigerian military in an international effort against the Boko Haram terrorist organisation. Additionally, the incumbent Buhari visited the White House and met with President Trump in 2018. Fein did not respond to a request by CRP for comment.